A rendering of telomerase, showing the enzyme’s various subunits. An enzyme called telomerase plays a significant role in aging and most cancers, but until recently many aspects of the enzyme’s structure could not be clearly seen. 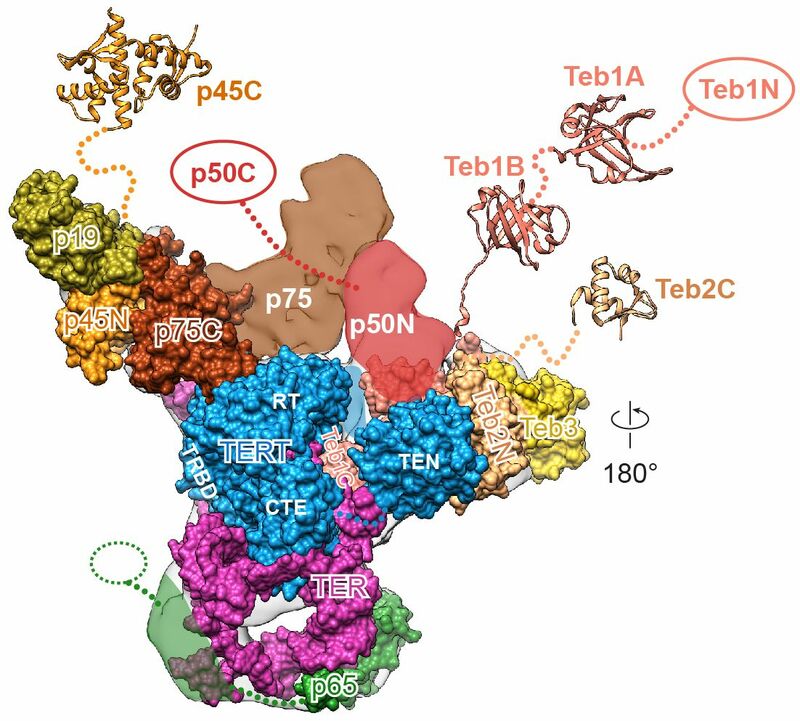 Now, scientists from UCLA and UC Berkeley have produced images of telomerase in much higher resolution than ever before, giving them major new insights about the enzyme. Their findings, published online today by the journal Science, could ultimately lead to new directions for treating cancer and preventing premature aging. 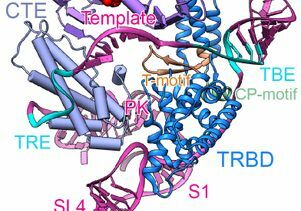 The research brought together experts in structural biology, biochemistry and biophysics, and a wide range of cutting-edge research techniques. Telomerase’s primary job is to maintain the DNA in telomeres, the structures at the ends of our chromosomes that act like the plastic tips at the ends of shoelaces. When telomerase isn’t active, each time our cells divide, the telomeres get shorter. When that happens, the telomeres eventually become so short that the cells stop dividing or die. On the other hand, cells with abnormally active telomerase can constantly rebuild their protective chromosomal caps and become immortal. Making cells immortal might sound like a promising prospect, but it actually is harmful because DNA errors accumulate over time, which damages cells, said Feigon, who also is a researcher at UCLA’s Molecular Biology Institute and an associate member of the UCLA–Department of Energy Institute of Genomics and Proteomics. Telomerase is particularly active in cancer cells, which helps make them immortal and enables cancer to grow and spread. Scientists believe that controlling the length of telomeres in cancer cells could be a way to prevent them from multiplying. When Feigon began her research on telomerase slightly more than a decade ago, she merely wanted to learn how telomerase works; fighting cancer and slowing the aging process were not even in the back of her mind. Earlier research led by UC San Francisco professor Elizabeth Blackburn revealed that telomerase was responsible for this activity, but the study didn’t connect telomerase to cancer and it provided little information about its structural biology. The research was conducted using tiny, single-celled microorganisms called Tetrahymena thermophila that are commonly found in freshwater ponds. Blackburn won a Nobel Prize in 2009 for the finding. Since then, Feigon and her colleagues have been filling in pieces of the telomerase puzzle, also using Tetrahymena. Their latest study found that the microorganism’s telomerase is more analogous to human telomerase than previously thought. Feigon’s research team knew that the RNA strand interacts with the proteins, but not exactly where it interacted. The new study found that within the enzyme’s “catalytic core,” which is formed by the RNA and its partner proteins TERT and p65, the RNA forms a ring around the donut-shaped TERT protein. 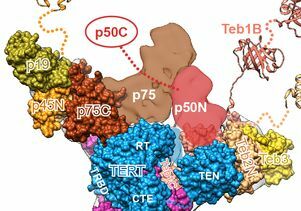 Scientists previously knew that telomerase contains three proteins, p75, p45 and p19, but their structures and functions were poorly understood. The new research identified the proteins’ structures and revealed that they are similar to proteins found at human telomeres. 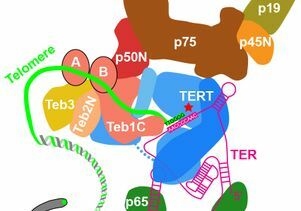 The researchers showed that a key protein called p50 interacts with several components of telomerase, including TERT, Teb1 and p75, and this network of interactions has important implications for telomerase’s function. Feigon knew that the Tetrahymena enzyme’s catalytic core, where the majority of the telomerase activity occurs, was a close analogue to the catalytic core in the human enzyme, but she did not previously know whether the other proteins had human counterparts. Feigon and her colleagues are working to fill in even more details of the telomerase puzzle. Their research could lead to the development of pharmaceuticals that target specific sub-units of telomerase and disrupt interactions between proteins. “There is so much potential for treating disease if we understand deeply how telomerase works,” Feigon said. 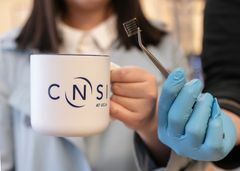 Among the technologies the researchers used to produce the groundbreaking images were UCLA’s cryoelectron microscopes, which are housed in the laboratory of Z. Hong Zhou, director of the Electron Imaging Center for Nanomachines at the California NanoSystems Institute at UCLA and a co-author of the paper. The researchers also used nuclear magnetic resonance spectroscopy, X-ray crystallography, mass spectrometry and biochemical methods. Henry Chan, a UCLA graduate student, was a co-lead author of the paper. 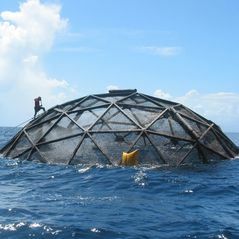 Other UCLA co-authors were postdoctoral scholar Darian Cash, former postdoctoral scholar Edward Miracco, staff scientist Rachel Ogorzalek Loo, senior staff scientist Duilio Cascio and graduate student Reid O’Brien Johnson, all of UCLA; and UC Berkeley graduate student Heather Upton. Senior authors were Zhou, UCLA biochemistry professor Joseph Loo and UC Berkeley professor Kathleen Collins. The research was funded by the National Institutes of Health (grants GM048123, GM071940, GM103479, R01GM054198, UL1TR000124) and the National Science Foundation (grant MCB1022379).